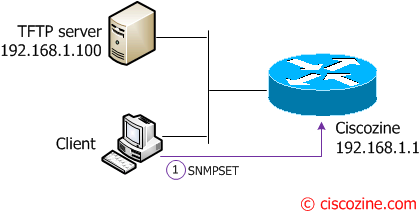 In the article “How to save configurations using SNMP“, I have explained how to get the Cisco configuration using SNMP. Now, I explain how to send commands via SNMP using the “ciscoConfigCopyMIB” MIB; with this MIB, you can replace running/startup configuration, send commands, save the “show” output or reload the device. First of all, check if your PC/Server has the SNMP suite; if not, install the net-snmp software (http://net-snmp.sourceforge.net/). snmp-community-string is the community key of your Cisco device; remember that the community must have write rights. 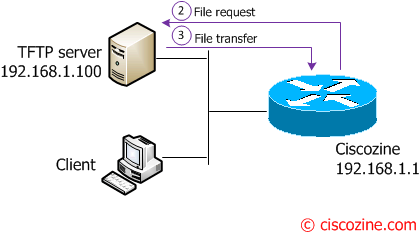 file-name is the file that contains the commands to be executed to your Cisco device. Remember: The command syntax are the same on linux or windows PCs. Suppose that you want overwrite the running configuration from a configuration saved in a text file (like a “copy tftp: running-config”). The client sends the “snmp set” commands to the router, then the router overwrites the running configuration with the “ciscozine.txt”, downloaded from the tftp server. After the snmpset commands, the device will create the loopback1 interface! Where [ip-device] is the ip address of the device that you want reload; the [snmp-community-string] is the snmp-server community (must be R/W). You must upload complete configurations when you use the snmpset command. Partial configurations erase what is currently stored in non-volatile RAM (NVRAM). This is only needed for startup configurations. When you run a configuration copy it merges the contents.